If the question is "Do we need any bananas?" the answer is always "Yes." Evening. Interior office. Andrew enters. ANDREW: How can there only be three bananas left? This morning, there were eight! MAUREEN: You mean there were eight bananas this morning, and then each of the five of us ate one and now there are three? HOW CAN THAT BE? He's right though, the rate at which we go through bananas is positively shocking. I cannot keep them in the house, even though I instituted a policy that anyone in a grocery store must buy bananas no matter how many bananas were purchased just yesterday. We are always out of bananas. I have a tendency towards obsession, so I have to be careful that I don't turn into a single-minded anti-sidewalk-parking vigilante. Instead, I have a plan. First, I will call back the Captain Richardson at the police department and ask him if he passed my message along to the officer who does work in the north part of the city. Second, I will continue to photograph the offending cars and file the photos away as though documenting a science experiment, the better to present to the police department or mayor's office, depending on how things go. 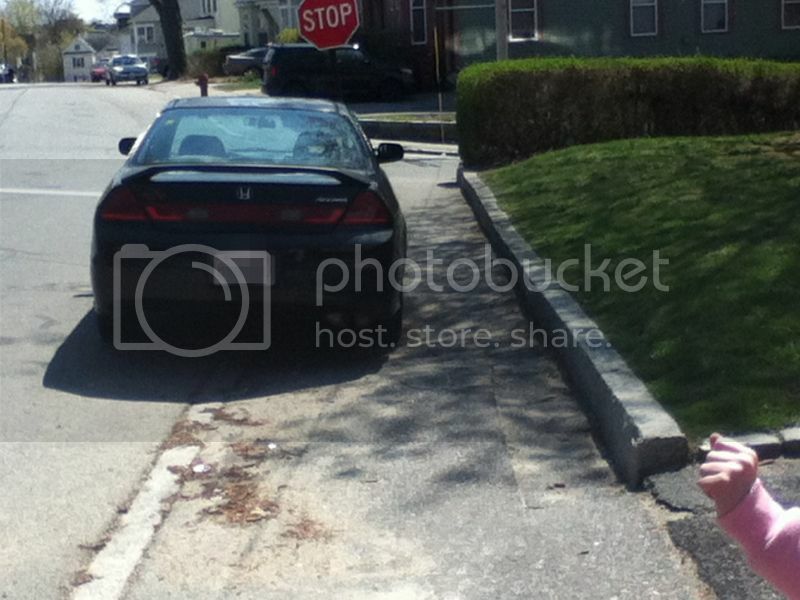 Third, I will continue to ask people not to park on the sidewalk if I see them near their cars. This can, as it turns out, have an effect. Because today, there were a few people on the porch of a house in front of which a car consistently parks with two wheels on the curb. Now I realize that it is not actually legal to park with any wheels on the curb, but if all of the problem cars parked like this, I would not be on a crusade. There is still room to get by on the sidewalk, so I wouldn't be forced into the street, and I wouldn't care that much. But cars like the Cadillac and Ford above have ruined it for everyone, and I can't start making exceptions. 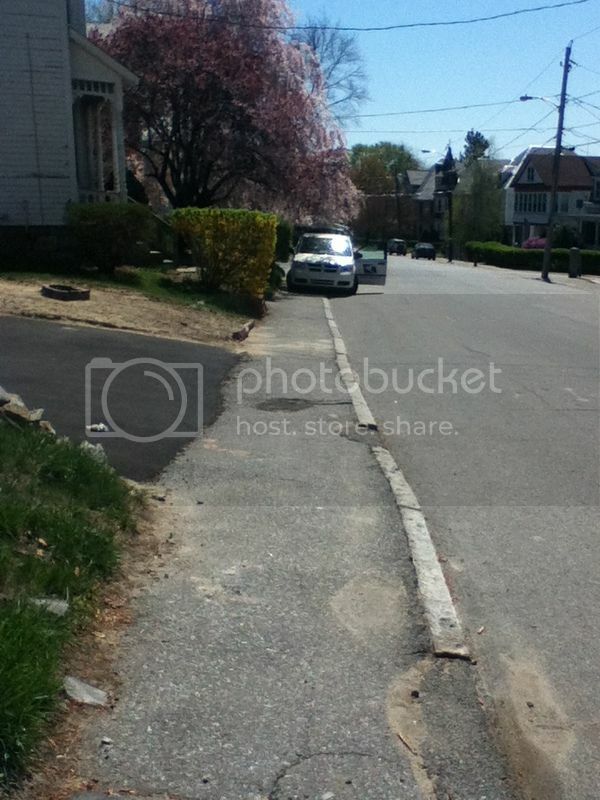 So I asked the people on the porch if they owned the car, and then asked them not to park on the sidewalk. "But I have to park on the sidewalk," the owner told me. 3. But I'm only going to be here for five minutes. So one apology out of five. Not a great percentage. 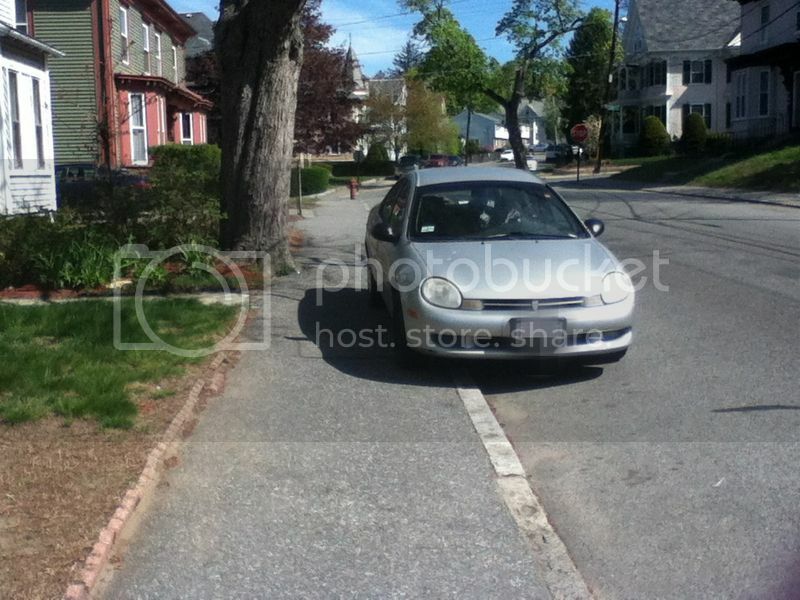 But let's return to today's encounter, in which the car's owner tried to explain to me that she needed to park on the sidewalk because the street was so dangerous. "Do you know how many cars have been totaled here?" she said. "But, you see, that is why I do not want to have to walk in the street with my children!" I said. "But everyone does it," she said. "That doesn't make it OK," I said. 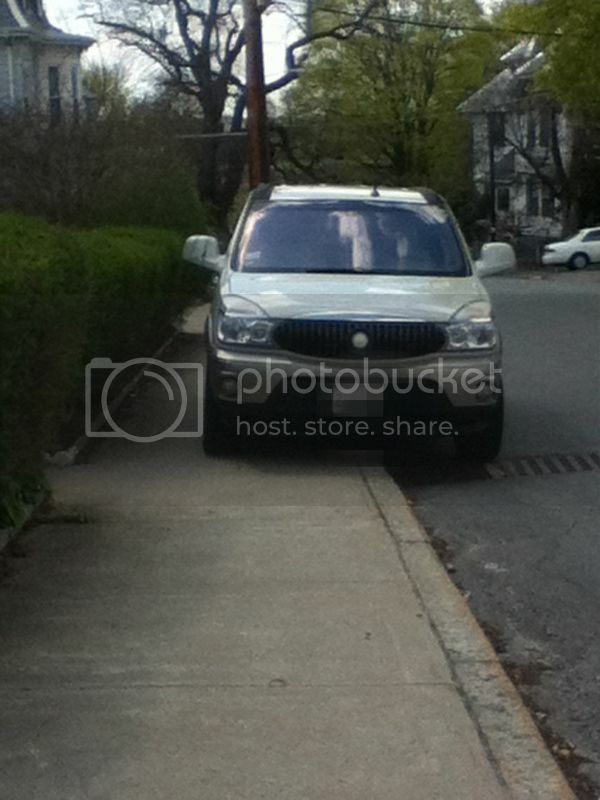 "You're not supposed to park on the sidewalk! 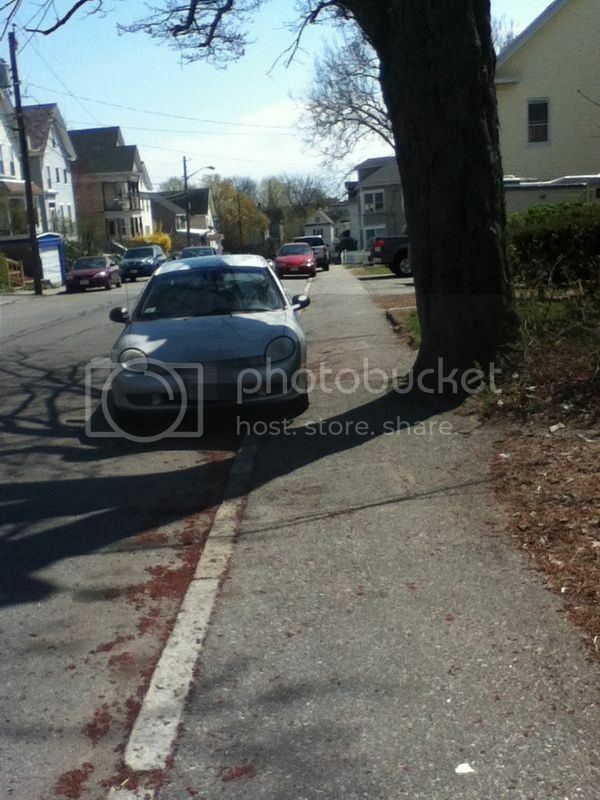 Please don't park on the sidewalk!" and then I had to keep walking, because I am terrible at confrontation and was starting to cry, but I could hear her saying, "OK. OK," as I walked away. And then! When we drove by later, I saw that she had moved her car! She moved it! Onto the street! I had to go out again later, and made a point to drive by her house to thank her for moving it, because she totally made my day. But for those of you who have also become invested in this, know that I am not going to give up. Last Friday I was forced with my stroller into the middle of a very busy major street because of a long line of sidewalk parkers, and this cannot stand. It is going to take a while, I think, because it is obvious that the culture needs to change, but I shall persevere. But without becoming unhealthily obsessed. The first photo is on the main street I use when walking to and from school with my three small children. It is a wide street with plenty of room for parking along both sides. The second photo is a side street off of the main street which is a bit narrower, but also less busy, and so cars aren’t usually parked along both sides. And even if they were, YOU CAN’T PARK YOUR CAR ON THE SIDEWALK. I have been brewing angry resentment at these cars for about four years now, getting angrier and angrier every time I have to walk in the street with my baby in a stroller and tell my three-year-old I will “meet her around” as she squeezes by the cars on the eight inches of sidewalk remaining next to the car. I kept wondering if I should leave notes on the cars asking the people to stop parking on the sidewalk, because I am pretty sure no one is thinking about the people who actually use the sidewalk for walking, but I’d have to leave at least fifteen notes, and it became ridiculous. I was also boiling with resentment about having to ask people not to park on the sidewalk. I shouldn’t have to ask them not to park on the sidewalk. 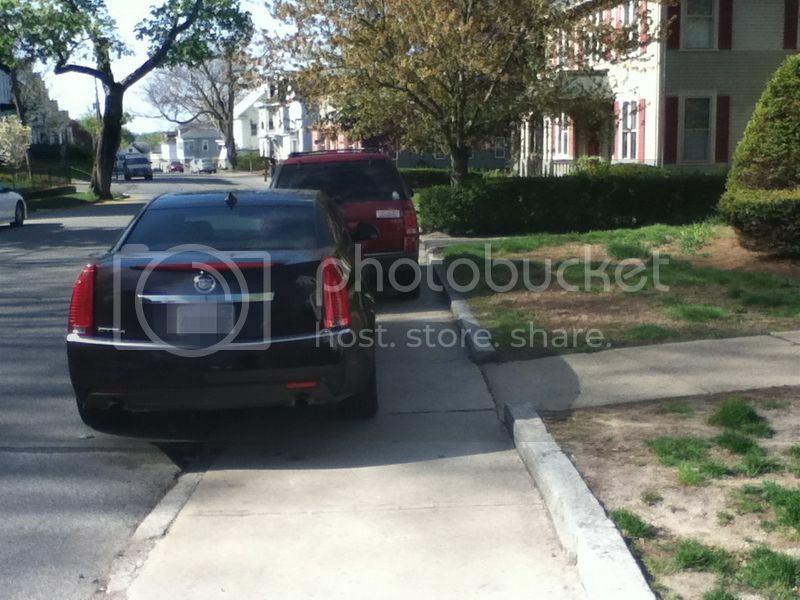 “No cars on the sidewalk” is a fairly elementary rule of driving. So I finally started calling the police, but I didn’t see any tickets and by the second call, there was a definite “Oh, THIS lady again,” tone in the voice of the officer who answered the phone. When I pointed out to her that I can’t get by when she parks like that, she looked at me and my stroller and my preschooler and was clearly embarrassed, but still explained that the cars on the street “drive so fast” and she “doesn’t want her car to be hit” but that she will “try not to park so close.” I said, “I understand that, but I don’t want to walk in the street.” I also pointed out that she is parked next to an enormous tree which encroaches on the sidewalk, thus making it even more difficult to get by, so she said she’d try not to park as close to the tree. Got that? She’s going to keep parking on the sidewalk, just not quite as far onto the sidewalk, and not quite as close to the tree. She’s not doing a good job with it, though. The other day, she was still there, just maybe three feet further back from the tree. I still can’t fit the stroller between her car and the tree. Also, she is, as always, parked facing the wrong way. I can certainly understand how she doesn’t want her car to get hit by the speedy traffic in the street, though. I feel similarly about myself and my children. This has become a pet project of mine. I met a city councilor last night at the senate primary (MA special election to replace John Kerry), and he gave me the name of a captain in the police, and I just left him a voicemail. So we’ll see.